And here they are, Emily Blunt and Anne Hathaway, last night at Critics’ Choice, both with new partners now, and both married, both on the awards show circuit -- next up: the Golden Globes on Sunday. That looks like such a sweet and genuine hug Emily’s giving Annie, congratulating her on her win. As I mentioned in the open, about holding back, what Anne has on (vintage Oscar De La Renta), is textbook holding back. It’ll be a lot more special at the Beverly Hilton, for sure. 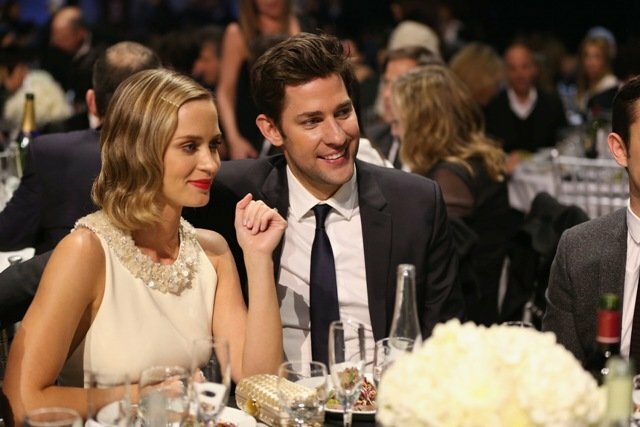 Also attached because it’s so cute -- Emily sitting on John Krasinski’s lap during the show and giggling with George Clooney.